Protecting places of worship is a challenge due to the open, public nature of the many activities held within. Many houses of prayer are forming security teams throughout the country to cope with the possible threats. Statistically speaking, attending some form of religious service is still relatively safe. However, too many shootings have occurred in a place of worship with grave consequences. As an administrator, it is imperative to safeguard against all threats to lives and property in question — including fire, theft, and vandalism. Additionally, everyone attending could benefit from qualified safety training provided by local law enforcement within the community. What measures does an electronic security firm such as ADS have to mitigate the risks? 1. Active Surveillance: Cameras provide visibility to all areas of the property day or night. They may also help congregation authorities determine who should and shouldn’t be onsite and when. 2. Situational Awareness: An administrator may use their smartphone or tablet to view video feeds. Any verified threats can be sent to our Central Station as well. Safe Systems believes that professional monitoring is a critical component of any successful security solution. 3. Door Access Control: Devices such as two-way voice/video intercom alert staff when someone might be in at the front office door. Additionally, key card access secures other entry doors and restricts guest access to sensitive areas. 4. Intrusion/Fire monitoring: Securing your building with traditional sensors such as glass break and motion detectors will trigger an alarm and send a notification to our Central Monitoring Station. Our monitoring station will also respond immediately to a fire alarm that is triggered by a smoke or heat detector. 5. Notification: Time is the critical component when facing any security threat. Wall mounted emergency stations, panic buttons, silent alarms, and devices worn on lanyards alert our monitoring staff quickly. First responders will be dispatched as soon as possible. 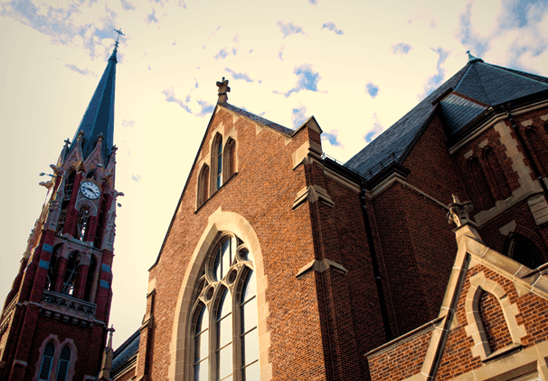 Safe Systems protects hundreds of church buildings throughout Colorado. We have proven experience in helping places of worship address their security needs. From our locksmiths to our camera techs, you can count on the SSI Team for expertise. Call 1.800.446.7519 for a free onsite security consultation.